Santhanam was born on 21st January 1980 in Pozhichalur, Chennai. He did his basic education in Pallavaram. He has a diploma in Electronics and Communication. 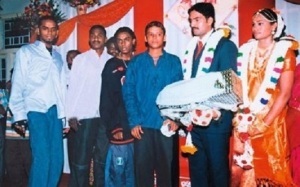 He started his career as part of comedy troupe named “Nungambakkam Boys Kondaatam”. His started his acting career in TV serials and gained popularity after Lollu Sabha aired on Vijay TV. He made his movie debut in a supporting role with Manmadhan in 2004 alongside Silambarasan Rajendar, Jyothika, Sindhu Tolani, Goundamani and Mandira Bedi. His first movie in lead role was with Arai En 305-il Kadavul in 2008 starring Prakash Raj, Ganja Karuppu and Jyothirmayi. His influence at box office was evident when movies like Leelai and Kadhal Pisase were able to get distributors after a very long delay. Santhanam ventured into film production with his owner banner named Handmade Films, his first movie was Kanna Laddu Thinna Aasaiya in 2013 opposite Srinivasan, Vishakha Singh and Sethu, the film was a box office success. He worked with top stars in Kollywood industry including Rajinikanth, Ajith, Surya Sivakumar, Vijay, Dhanush, Arya, Jayam Ravi and others. 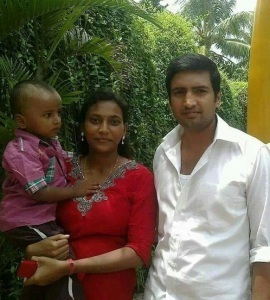 Santhanam is married to Usha.